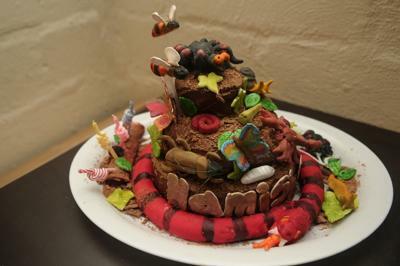 I made this bugs, spiders and snake garden cake for my son who wanted a Snakes & Bugs theme for his 4th birthday party and asked for a "big cake with the snake squeezing the cake". This method means that the colors are more vibrant but uses less coloring than if you colored the fondant. I cut out a lot of different leaves from rolled out fondant using various leaf cutters and dried and painted them in the same way. I made the butterflies, spiderwebs and letters with piped royal icing which I painted when dry, the spiderwebs with silver and the letters with gold mixed with red edible glitter. I used florists wire for the various antennae and the leaf-hopper’s delicate legs, which I painted with the food coloring along with the bugs. The day before the party I made 3 sizes of chocolate cake which I coated with a mixture of milk and dark chocolate melted with a bit of butter (keeping some for later). Once assembled I sprinkled with a Cadbury's Flake to look like soil. When it had set I made the snake from rolled out fondant filled with long marshmallows (apart from the head end which was filled with extra fondant icing) and sealed, then molded the head and added eyes, tongue and fangs. I used a petal cutter to imprint a scale pattern on the snake then painted it with food coloring. I wrapped it around the bottom cake then secured the bugs, leaves and lettering with the melted leftover chocolate. I stuck clear drinking straws into the bottoms of the bees and stuck these into the cake to make them "fly". I also made a "log" from fondant icing wrapped around a marshmallow and painted brown to put the candles into. I sprinkled another Cadbury Flake around the cake to look like soil. You sure put tons of work in that and it shows! WOW!!!!!!!!!!!!!!!!!!!!!!!!!!! I love it !!! Wow...this cake looks awesome. I have never seen anything like it. Keep on posting.